Wordsworth never intended The Prelude to be his magnum opus. The clue is in the title (though this title was given to the poem by Wordsworth’s executors after his death). The Prelude was written as a prelude or an introduction to The Recluse, the great philosophical poem that Wordsworth, encouraged by Coleridge, dreamed of writing but never completed. It’s one of the ironies of literary history that Wordsworth, lamenting in verse his own inability to write a great poem, didn’t realise that in doing so he was in fact writing one of the greatest poems. Never satisfied with it, Wordsworth continued to work on, expand and revise The Prelude until his death in 1850. As a result there are several different versions of the poem available to us. The Prelude is unparallelled in its detailed portrayal of the writer’s sense of his self and his mind. It traces the history of Wordsworth’s life from his earliest childhood to the point at which he began writing the poem at the age of about thirty, and records his flaws, his fears, his loves, and his ambitions. But The Prelude is now read mainly by scholars and students; most readers turn instead to Tintern Abbey, the Intimations of Immortality ode, and of course ‘I wandered lonely as a cloud’. There is probably one principal and very understandable reason for this: The Prelude is daunting in its size. The two longest versions of the poem are thirteen and fourteen Books and around eight thousand lines long. One way of getting around this is to read the 1798 ‘Two-Part Prelude’. This is a much shorter sort of draft version, an embryo of the poem that Wordsworth was to develop over the next fifty years. It’s just two Books long, each Book about five hundred lines, but it contains many of the most beautiful and memorable passages of the poem. It’s made up of a series of what Wordsworth called ‘spots of time’: episodes drawn from his childhood, in which he felt a particularly strong communion with nature, and felt his visionary power to be at its height. Those readers who do brave the much longer 13-Book Prelude of 1805, or the 14-Book Prelude of 1850, will likely still be drawn to these same ‘spots of time’, along with a few new ‘spots’ which Wordsworth adds. (The 1805 and 1850 versions are for the most part the same, but contain some intriguing revisions which hint at Wordsworth’s changing opinions as he grew older.) So what is to be gained by investing time and energy in one of these much longer versions of the poem? When Wordsworth gives himself more room for extended narrative, his poetic power comes across less intensely than in the spots of time. But some of these narrative sequences are perhaps more subtly beautiful. We read of Wordsworth’s gradual descent into self-satisfied indolence as a student at Cambridge, of his growing sense of ambivalent horror at the chaos and crowds of London, and of course of his heady experience in revolutionary France, when ‘Bliss was it in that dawn to be alive, / But to be young was very Heaven!’ These accounts are thoughtful, sorrowful, and funny, and the experiences that they describe cannot be conveyed in a brief flash. Above all, what the longer versions of The Prelude offer is a sense of time passing. In its very length, the expanded poem creates for its reader an experience of change, flux, but also continuity, as he or she reads – the same experience that Wordsworth describes having within the poem. It’s ‘an unreasoning progress’: there’s no single, traceable story either of loss or of gain. Life isn’t one straightforward narrative and neither is Wordsworth’s poem about his life. But travelling through the poem with Wordsworth, we begin to understand and feel the anxieties that he describes: how can we remember everything, and fit it into a narrative that makes sense? Where is all this leading? Spending more than three years with The Prelude as I worked on it for my PhD, I often felt the pertinence of such questions. I flicked between different passages as I analysed them, extracting them for close attention. The Prelude lends itself to this kind of reading because for the most part it is structured as a series of those short ‘spots of time’, interspersed with philosophical or slightly longer narrative passages. But a sense of the weight and the sheer size of the full poem was always there, even in the size of the book I was holding. It felt like I was mining a huge cavern for the parts I wanted. It was an exercise of memory that reflected Wordsworth’s own as he looked back over his past, searching for what mattered. Usurped upon far as the sight could reach. These lines evoke a sense of great achievement, the climax of a huge effort (Wordsworth’s ascent up the mountain, his completion of his great poem, and the reader’s coming to the end of a long book), but also a sense of being overwhelmed by it all: what does it all mean? Having read and returned to The Prelude repeatedly, I still couldn’t tell you what it all means. But that’s life. 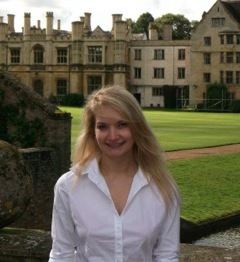 Tess Somervell is a PhD candidate at Clare College,University of Cambridge. Her research is on the intersection between time and eternity in Milton’s Paradise Lost, Thomson’s Seasons, and Wordsworth’s Prelude.